"Anne de Villem? ?jane's work explores femininity; she creates delicate, elongated, quiet women. Their poses are reflective, pensive, maybe pre-occupied even. The artist depicts women from the point of view of her inner life, as the works go beyond portraiture to reach the essence of womanhood"
Barbara Stehle -Art Historian-Rhode Island School of Design. Anne de Villem? ?jane is an established french artist, residing in New York. 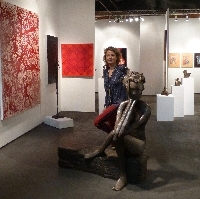 Her sculptures in bronze, crystal or cement, are exhibited in galleries and major art shows in the United States, Europe and Middle East-including most recently Art market and Design Hamptons, Texas contemporary, SCOPE New York or Miami. I believe in serene, poetic works of art. I create timeless imaginative and figurative sculptures which occupy the space in a strong yet peaceful manner. My work revolves mainly around femininity and materiality. I enjoy the challenge of creating fragile, feminine figures out of raw construction materials such as cement, screws, nails or wires of all sorts. These women appear delicate and strong at the same time. They are pensive, reflecting on the pace and challenges of the outter world. The textural imprints are key to the works, as a sign of what constructs oneself. As navigating through the various forms and shapes , the viewer dives into the sculpture's soul. French artist based in NY with a curious mind , I explore an array of media in sculpture, such as cement and metal, bronze , crystal. resin or acrylic. My portfolio also includes paintings and photographic work.